I have finally truly arrived. After a week as a houseguest, in which I earned my keep mostly by doing dishes and making salads, I have found a temporary room to rent through the end of August. I have moved in with Z, a local celebrity, who has an eclectic house surrounded by vineyards outside of Healdsburg – that’s 90 minutes north of San Francisco for those of you following along at home. Other than my most indulgent friends and parents who held my hand while I hyperventilated and canvassed craigslist with me, my true debt right now is owed to the inestimable Helen, sent by Dionysus, god of wine and winemaking (ie, the Smith College alumni directory). Helen fights the good fight: making great wine and also saving my skin. She works unbelievably hard. She is the winemaker at one winery (www.bryantwines.com) and, with her husband and fellow badass, owns and operates her own label (www.keplingerwines.com). When not making super classy wine (this stuff is the real deal), she is making super classy jam, irrigating her prodigious gardens, surfing, and finding me a job. Or housing. Or teaching me how to tell the difference between a radish and a weed. Or how to compost. And what’s in wine. 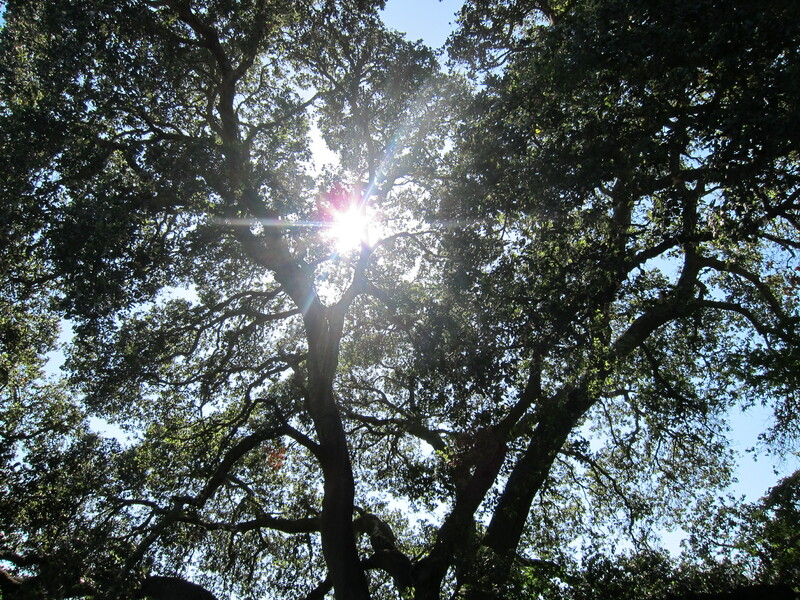 So Helen took me into her lovely home that overlooks this (this ^) enormous live oak tree and filled me with stuffed squash blossoms, sheep’s milk ricotta, local pork, eggs from her own chickens, and the best wine I’ve ever tasted. She put me up while I found a place to live, and now I’ve got one. WHICH TOOK 6 WEEKS, one of which was spent on the ground here in the Napa and Sonoma valleys, covering dozens of miles every day looking for apartments and discovering the beautiful and frustratingly inaccessible towns of Calistoga, St Helena, Sonoma, Glen Ellen, Santa Rosa, Healdsburg, &c. And all that with gas at $4 a gallon! 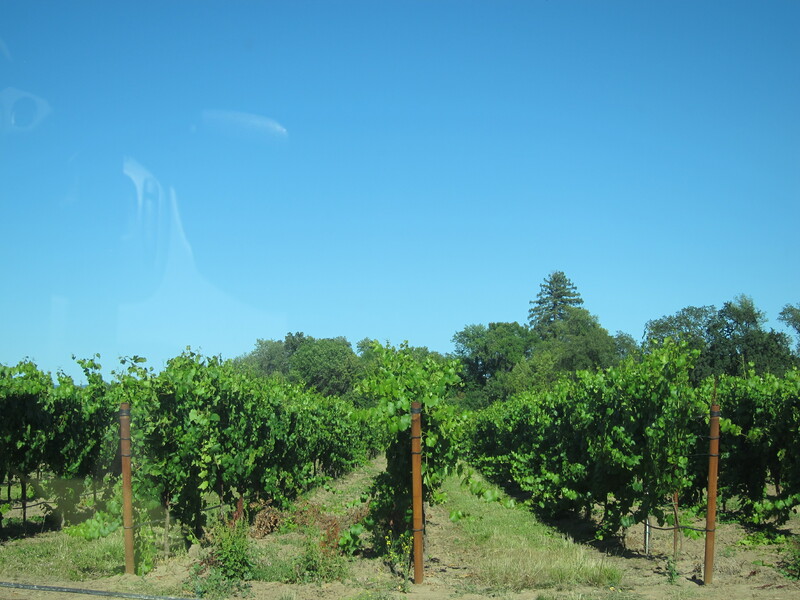 But I have yet to tire of the twisty country roads, so fun to drive (less fun in the passenger seat), where the light trickles through towering oak and redwood groves, lined of course by endless vineyards, stretching out sometimes for miles or just a few square yards on a hillside. They seem to coat every visible surface in their straight even lines that are so aesthetically satisfying for reasons I can’t quite put my finger on. Right now the vines are approaching their fullest leaf (harvest starts in about 2 months), and are so green and heavy. The job starts Tuesday, at long last. So far I’ve met the guys that I’ll be working with and right now I’m a little concerned about my COMPLETE lack of knowledge despite doing my homework, but I’m just going to have to fake it till I make it. I am also seriously hoping that what I’ve been told is true: a women’s education prepares you for a male-dominated workforce. That’s what the pamphlets told me four years ago when I was considering attending Smith; that’s what I preached in my capacity as a Smith tour guide and admissions interviewer. Time to put the slogan to the test. I plan to have red wine mouth for the greater part of the next 5 months. Soon I’ll be joined by my dear sidekick Esther. Together we braved the wilds of poetry, honors theses, Modernist literature, and literary theory together – not to mention a 3700 mile-long road trip through 19 states, 1 hot cheesy in Lynchburg, VA and 3 time zones (but what blasted time zone is Arizona in?? tell me THAT). So now we’ve gotten ourselves into a brand new mess. I’m counting the days until we can compare stained cuticles. Esther is currently earning her keep and preparing for harvest by working in a wine store in downtown Boston. She will contribute occasional field notes from there through the summer and will start sharing her actual field notes once she gets out here, in the fields. I feel like I’ve got some mettle to prove; when the guys took me into the cellar room a few days ago to taste the current vintages-in-progress (see I don’t even know the terminology), they plopped down a bucket (really!) for spitting and said “it’s okay if you miss, it takes some practice.” I nailed it on the first shot, with my fingers crossed in my pockets. Stay tuned as Esther and I learn how to operate a forklift, stomp things, enjoy 7 am – 2 am shifts, and do everything wrong. I’m so excited for you, Ms.Green! I can’t wait to hear about how you conquer EVERYTHING, as I know you will and as you ALWAYS do.